Home SaaS Referrals- What’s An Ideal Post Referral Strategy? 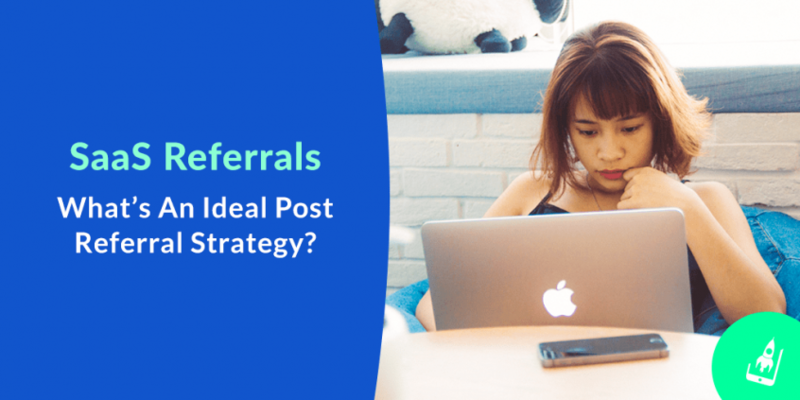 SaaS Referrals- What’s An Ideal Post Referral Strategy? Even though marketers spend thousands of dollars to attract a user’s attention, our users still consider recommendations from their friends and peers as a top tactic before they sign up for our SaaS product. One of the most significant reasons behind this mindset is the trust that users associate with ‘referrals’ thereby making this marketing channel a high-value currency. It isn’t surprising that many SaaS businesses choose to invest into referral marketing in order to consistently gain from it. That being said, getting a user to sign up for your referral program is no easy task, and a lot of planning and strategizing is required in order for it to click in the mind of a prospect. The irony is that even though marketers tend to invest a lot in referral marketing, they are often clueless on how to capitalize on such users once they show interest and decide to sign up for their referral program. Users acquired via the referral route are found to be more loyal in the long run, as compared to users who are acquired via other acquisition channels. Such users stick to the product for long and therefore are the best people to refer your product ahead. That’s why a solid post referral strategy is a much-needed part of a larger scheme of things that concern a referral campaign. In this article, we’ll share with you some simple and actionable tactics to gain the most from such a strategy. The most exciting part of signing up for a referral campaign is the incentive associated with it. Users want to quickly apply the referral code or use the link in order to avail the discount. By offering them an additional discount if they share their code with others on social media. This way marketers can tap more prospects from the extended network of the new user as compared to gaining only a single friend. 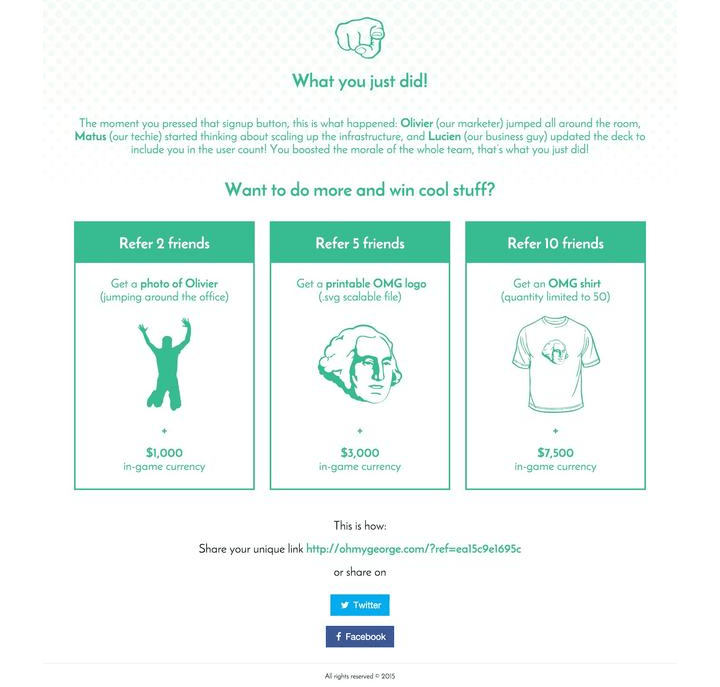 By sending an email that gently nudges the user to refer more. This email could work wonders if it sent to the new user a couple of hours after he lands on the referral thank-you page. An exciting copy which highlights the freebies can further ramp up his decision to take an immediate action on such an email. This strategy will add more referred users to your kitty. 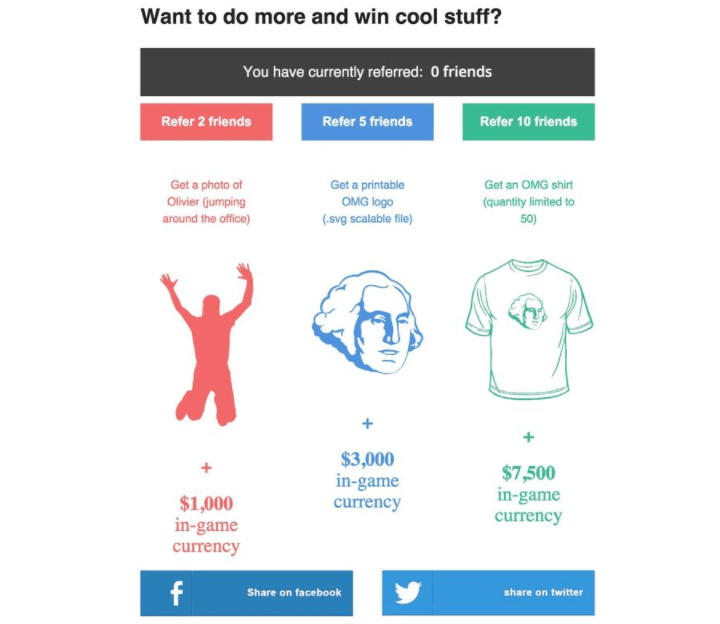 Ohmygeorge used a similar copy while using referral marketing to boost their Betalist launch. Whether it is a discount or some other freebie that you’re offering, this initial moment of excitement if seized properly can help you get more from your users once they’ve already signed up for your referral campaign. Once a user has devoured the incentive attached with your referral campaign, it is very hard to get back their attention. That’s why you need to keep them motivated so that they continue to refer more and more people. The simplest way to do this is by crafting and sending a follow-up email. 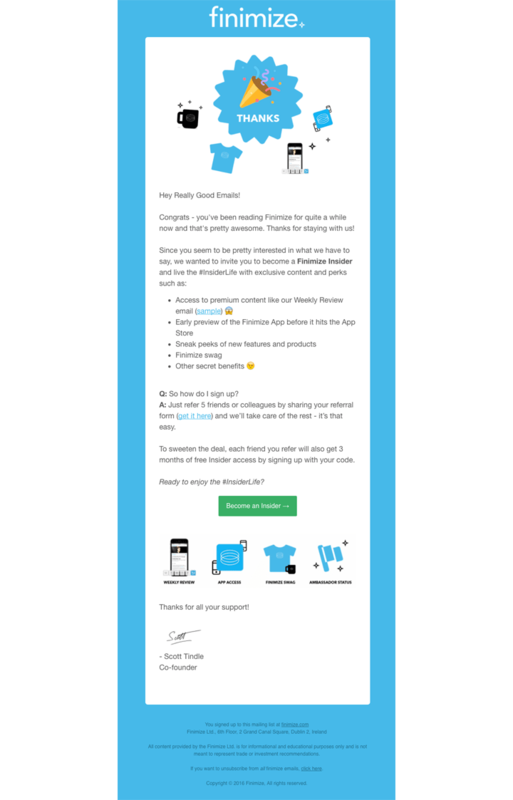 This reminder email will serve two purposes- it will not only remind the user of the impending incentive that they can gain from but also convey the value that your product can provide to others in their network. A referral marketing campaign shouldn’t be treated as a standalone entity in your overall marketing plan. You need to provide ongoing engagement to those who’ve opted for your SaaS referral in order to be able to gain favorably from them. The more a user is engaged with your product, the less likely they are going to churn. By offering them continuous engagement after they’ve signed up for a referral, you are essentially pushing them deeper in the funnel. UBER and Hotel Tonight have developed an ingenious post engagement strategy for its users who have already signed up for their app. Hotel Tonight uses newsletter as a medium to introduce engaging marketing initiatives to them, such as the one below. Notice how they’ve cleverly placed the ‘refer-a-friend’ bait in the newsletter. UBER, on the other hand, offers co-branded experiences to its users as a part of its broader engagement strategy. From #UberKITTENS to make-up makeovers, UBER leaves no stone unturned when it come to keeping their referred user engaged through their app. Given that a user is already hopped on to your product after being referred, such out-of-the-box experiences make them stay with the product longer than usual. This strategy also builds up organic word of mouth. 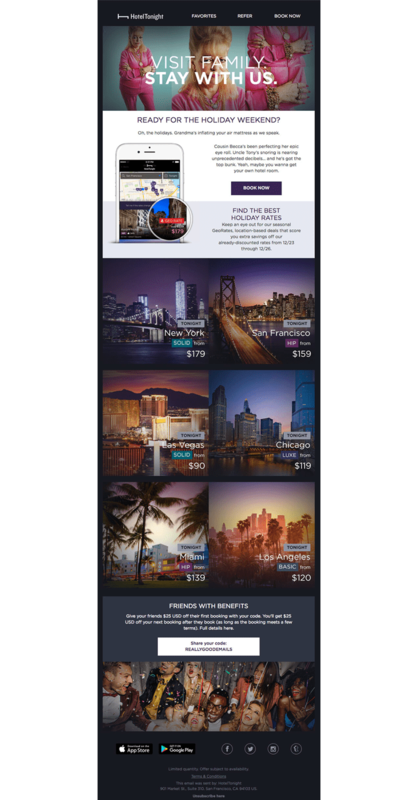 SaaS Marketers can learn a lot from the post sign-up strategy used by UBER and HotelTonight while developing a similar plan for their product. People refer a product only when they are satisfied with it, and they can foresee logical value in it. They want to be sure that a product they suggest is strong enough for a recommendation and does not backfire in way that spoils their image. By constantly reminding a user about your product and its benefits you can pave the way for future referrals. 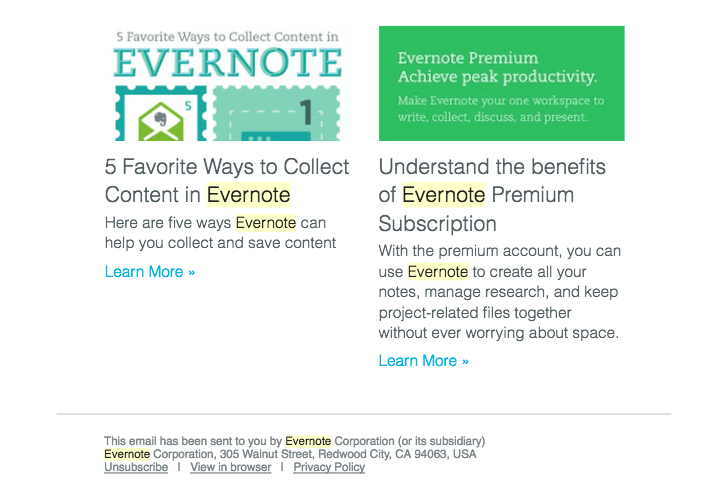 Evernote does this brilliantly by consistently sending valuable information to their users through its email newsletter. Given that users already have access to information about the product, it makes it easy for them to refer it whenever required. We all go wrong with our campaign strategy now and then. That’s where you can use the expertise of users who’ve already signed up for your referral campaign in order to better it. You can also further incentivize such users in order to get more reviews. It’s pretty difficult to get a set of loyalists for your product, but when you do, you should be able to channelise their loyalty into something more meaningful. That’s when an ‘ambassador’ or ‘insider’ program makes a lot of sense. These ambassadors can not only double as your spokesperson but also help you in creating an extended community of users who are ready to adopt your product. Many SaaS products have used a similar strategy to create word of mouth around their product and constantly gain from their loyal customers. There are a lot of challenges in the SaaS marketing world today- cut throat competition being the biggest of them all. 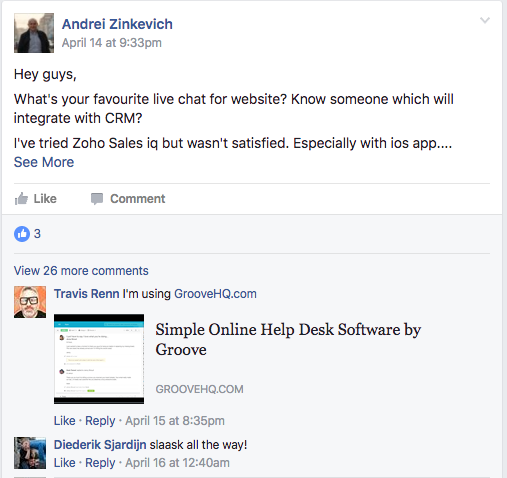 Cold emails, social media outreach, offline promotions, co-promotions, you name the tactic and the chances are that it has already been tried by a fellow marketer to attract users to their SaaS product. But again, nothing works like referral marketing for SaaS product growth. Referral marketing has its benefits, and with a powerful post referral strategy, you can make the most out of your valued users. Taru is the Content Ninja at AppVirality Inc. She has a keen interest in mobile and digital marketing stories and dissects them - word by word. She loves good food, tea and slapstick humor.